Having just completed a weeklong series of events in Croatia for Ultra Europe, Ultra Worldwide recently revealed the first names set to perform at the inaugural edition of Road To Ultra Singapore! 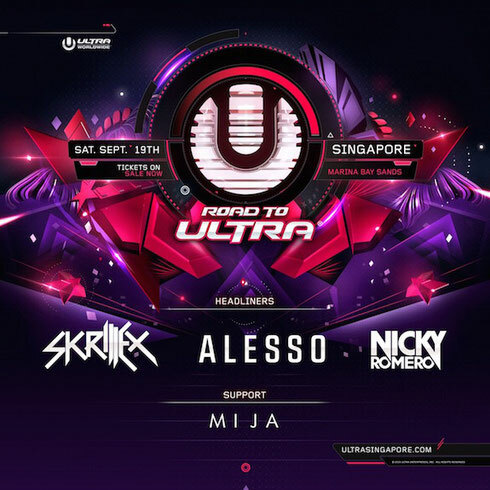 Gearing up to transform the Marina Bay Sands Convention Centre on 19 September, Road To Ultra Singapore will be welcoming Skrillex, Alesso, Nicky Romero and Mija, the first group of DJs to join the bill in the Phase One announcement. Skrillex, Alesso and Nicky Romero will be showcasing their performances to the Marina Bay for the first time, while Mija will be making her debut Ultra performance, bringing her jacking bass-heavy sound to the attention of the Southeast Asian Island. Ultra Worldwide will be extending their reputation to Singapore later this year, complete with cutting edge stage production, visuals and quality sound. Fans from across Singapore and beyond can look forward to experiencing the same level of production and the ‘Ultra experience’ found at any of their international events. Coinciding with Singapore’s Formula 1 weekend, over 10,000 fans are expected to descend upon the bay front location to witness some of the hottest acts in electronic music, for what will be a big occasion. For more info, check: www.ultrasingapore.com.